Those days when the weather was warm and the sun was shining have become a distant memory. As you look around your garden, you notice the golden orange leaves falling lazily onto the ground and shrubs turning bare. With the nights closing in quicker, rain falling more often and the air getting cold it is time to overwinter the plants, put away the barbecue, winterize your gazebo, and cover the outdoor furniture with a waterproof covering that can withstand the harsh cold, wet, and freezing elements. Here are some tips to help you prepare your garden to welcome the cold winter months. While summer is the time to mow the lawn and keep the blades springy short, fall is the time to ensure your garden can take the brunt of winter. The last thing you need is the lawn withering away in the cold. Trim those overhanging branches, so that they don’t fall and injure you while you are walking around your garden. Turn off the water to the hose pipe, as you won’t need to water the lawn. Give the lawn one final trim and then rake the leaves. Be sure to fertilize the lawn late fall, so that it has sufficient nutrients to resist the cold and wake up from hibernation in spring. The pre-cut Western Red Cedar panels that were part of your DIY gazebo kit are extremely resilient, sturdy and durable. They can take winter quite well without showing any signs of damage or wear and tear. However, you should still take measures to winterize your gazebo before you decide to head indoors into the warmth for winter. This way, your gazebo will not sustain expensive winter damage (warping or splintering of wood) and you will be able to use it when spring and summer come the next year. 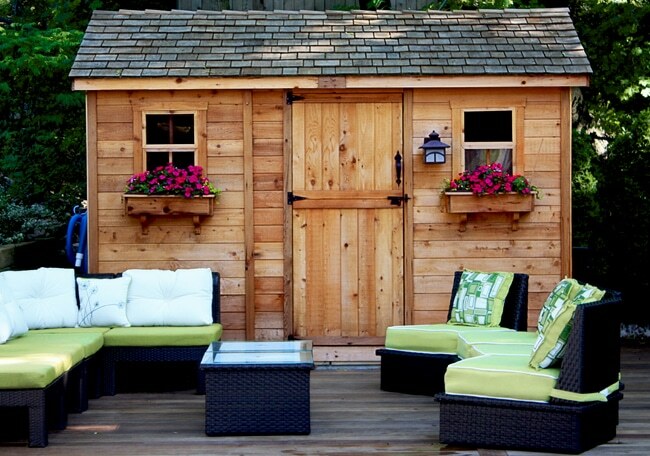 Remove the furniture from the gazebo and store them in your garden shed or patio with appropriate winter protection. When fall ends, sweep and rake leaves, debris, twigs and dirt from the floor and walls of your gazebo. Remove cobwebs and clean spaces between the steps and benches to ensure pests don’t make their house there during the winter months. As strange as it may sound, but hosing your gazebo will help remove debris that you may have missed while sweeping. Focus your attention on cracks and crevices. Use a soft-bristled brush to remove algae, mold, and mildew. Clean with warm water and mild liquid detergent. Remember, never use a wire brush, as it will scratch and abrade the wood. Make one final check for loose screws. Use your screwdriver to tighten them. Make it a point to come to your gazebo periodically during winter to check it. This is also a fantastic time to remove snow from the roof. You can fix vinyl plastic sheets on the gazebo roof to ensure the snow doesn’t damage the roof and also slides off easily. Today, you can get gazebos in a range of designs and styles. Some of them can even be used in winter if you install a portable heating. So, if you want to enjoy the great outdoors, even in cold winter months, look for a DIY gazebo kit with framed screens for the sides and cupola and a screened door. This gazebo can be heated and used even in winter. Most homeowners believe spring and summer are the only seasons when their gardens turn into veritable oasis and then the color goes out once winter sets in. However, this is not true. Check with a local nursery for flowers that bloom in winter and plant them. Make it point to plant the seeds in early spring so that in the middle of winter, you will see a splash of color in your garden. Some flowers that are perfect for winter months include pansies, violas, and primroses. However, be sure to spread mulch in the flowerbeds to prevent the soil from freezing. You may want to put bubble wrap around plants that are sensitive to the cold and transfer them indoors or into your garden shed. Just make sure they get enough sunlight and fresh air to survive through the winter. Use these tips to winterize your gazebo and to prepare your garden for the colder month, so that it can come back to life when spring returns.